Snæfellsnes is filled with diversity, inspiration and you will be energized ! First we drive the tunnel under the fjord Hvalfjörður, the only tunnel in Iceland that sits below sea level (136 meters). We visit the small town of Borgarnes. Then we go to the Snæfellsnes peninsula, the old Eldborg crater and stop to see Gerðuberg basalt columns. Our tour then takes us to Búðir, the old Búðir church, the old fisherman’s village Arnarstapi and Hellnar. We will see the glacier Snæfellsjökull volcano. The glacier is a revered symbol of Iceland. With a height of 1446 m, it is the tallest mountain on the peninsula. 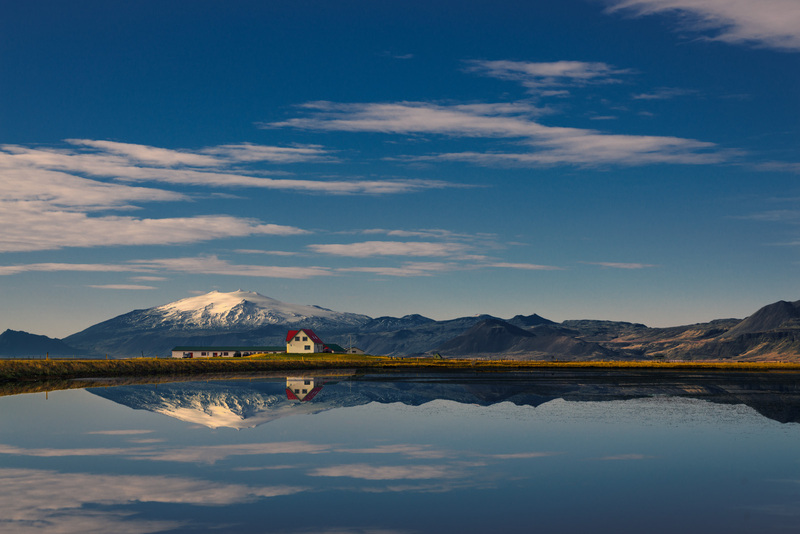 Snæfellsjökull is also known as the setting for the novel “Journey to the Center of the Earth” by the French author, Jules Verne. Then we drive through the Snæfellsjökull National Park to see the Vatnshellir Cave, 8,000-year old lava tube that contains multiple caverns and is situated 32 m below the Earth’s surface. We will go to the beach Djúpalónssandur, with its dramatic rock formations. Djúpalónssandur beach is one of the highlights of Snæfellsnes peninsula wonders. Our journey ends with a drive to the North to see the Kirkjufell mountain (463 m). Known as the “guardian of Grundarfjörður’s northern vista”, the Kirkjufell is one of the most photographed spots in Iceland. Then we drive back to Reykjavík, full of energy and new experience!